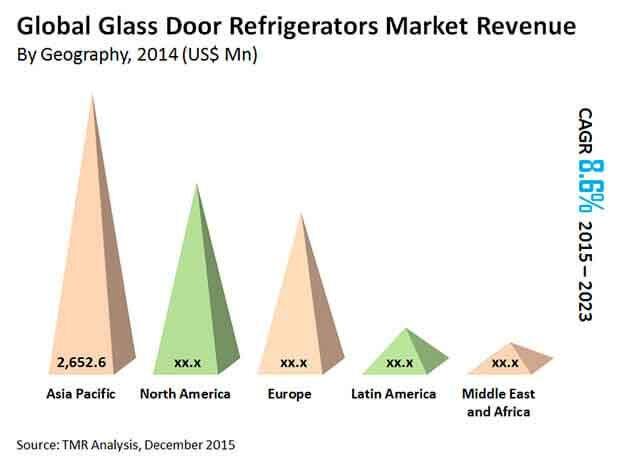 The competitive landscape of the global glass door refrigerators market is characterized by the intense competition between the small-scale manufacturers, finds a new study by Transparency Market Research (TMR). With just a few established names, such as Dover Corp., Carrier Corp., Hoshizaki Int., and Hussman Int., the market demonstrates a highly fragmented structure. Currently, developing economies are the main targets of the leading vendors of glass door refrigerators across the world. Since the prominent retail chains are aggressively focusing on expanding their bases in emerging countries, these players can see potential opportunities for further growth in these regions, states the research report. As per the research study, the global door refrigerators market are reporting a remarkable rise in in their valuation. In 2014, the opportunity in this market was US$6.5 bn. Rising at a CAGR of 8.60% over the period from 2015 to 2023, researchers expect it to reach US$13.7 bn by the end of the forecast period. The demand for glass door refrigerators with a 3.1 - 6.0 cu ft. capacity is significantly greater than other refrigerators in this segment at present and the trend is anticipated to remain so in the near future. Hypermarkets will continue to be the most preferred distribution channel for the purchase of glass door refrigerators in the years to come. In terms of the region, Asia Pacific has been dominating the global market over the last few years. Proliferating at a CAGR of 9.50%, this regional market is expected to remain on the top position throughout the period of the forecast, notes the research study. “The global market for glass door refrigerators is gaining substantially from the rapid proliferation of retail distribution channels across the world,” says a researcher at TMR. With the constantly rising competition in the retail sector, convenience stores and supermarkets/hypermarkets are required to use glass door refrigerators in order to keep their products cool as well as visible to ensure their sales. Going forward, the developing economies are expected to offer ample opportunities for growth to the manufacturers of glass door refrigerators across the world. A large pool of retail chain operators are expanding in emerging economies of South America and Asia due to the saturation in the developed markets, especially in North America and of Europe. This, as a result, is expected to assist the domestic glass door refrigerators markets in Asia and South Africa to evolve substantially in the near future, supporting the local vendors, states the market report. On the other hand, the easy availability of alternative cooling solutions across the world is anticipated to impact the demand for glass door refrigerators negatively over the next few years. When compared to large refrigeration systems, such as glass door refrigerators, alternative cooling solutions, such as cold chain solutions and temperature-controlled packaging systems are largely preferred among small-scale retailers due to their low cost, notes the study.